Courtesy WWE The Macho Man's outfits were visible from space, and that's just the way he wanted it. then gets sucker punched by Young Guy. The crowd is appalled. The announcer is appalled. Hell, I am appalled. Young Guy won't stop punching and kicking Older Guy. He grabs a chair and creams Older Guy with it. Right in the noggin. Older Guy wobbles to his feet and gets clubbed again. The crowd is screaming as though it's watching a baby get dangled out of a window. The fans don't want Older Guy to rise again, but of course, he can't help himself. He staggers to his feet one more time, "bleeding PROFUSELY!" as the announcer says. Young Guy readies the chair. I can't believe what's happening. I am witnessing a murder. Older Guy crumples into a heap, blood pouring from his head. Young Guy disdainfully tosses the chair away, soaks in the jeers for a few seconds, then struts out of the ring wearing an evil smirk. Older Guy doesn't move. He's lying in a puddle of hemoglobin. He's dead. He's definitely dead. They go to commercial. I keep watching. I need to see what happens. they had me. I watched every Saturday after that, quickly realizing many of the stereotypes of an '80s wrestling fan: obsessed with sports, awkward around girls, tons of time on my hands, just smart enough to enjoy the funniest things about wrestling and just dumb enough never to ask questions. This was like joining a little club of sorts. We had our Saturday TV show, our magazines, our live event that passed through town every month or so, our T-shirts, our posters, and that was about it. We kept to ourselves. We didn't bother anyone. We didn't try to convert anyone. Whenever we found other wrestling fans, we bonded with them immediately. Back then, we played up every "real" moment and brushed over the sketchier stuff. One time in Madison Square Garden, I watched Bob Backlund break out of Big John Studd's dreaded backbreaker by steering him toward the corner, pushing off the turnbuckle, then toppling Studd over and pinning him. A few weeks later, I attended another Studd-Backlund main event in Boston Garden that ended the same way. Hmmmmmm. Had to be a coincidence. Studd was stupid for falling for the same trick twice. I wasn't lying to myself, just believing what I wanted to believe. but at the heart of it, we loved straddling that line, when something intended to be fake ended up feeling real. Piper pounding Snuka with coconuts? Real. Killer Khan breaking Andre's leg? Real. Sgt. Slaughter defending America's honor from the Iron Sheik? Real. It helped that wrestling crowds sounded as good as or better than any other crowd, like the Boot Camp Match in Madison Square Garden when Sarge coldcocked Sheik with the boot, then everyone shrieked the referee's count in unison. Onnnnne! Twwwwwo! Threeeeeee! Hrraaaaaaaaaaaaaaaaaaaaahhhhhhhhhhhhh! That wasn't real? popular. You know when a musical band hits it big and its original fans resent sharing the band with everyone else? That was Hogan. His new fans didn't care that he had only four moves, that he couldn't carry a bad opponent, that his matches ended the same way every time. He catered to those bandwagon morons. We found ourselves blaming him for it. Just a little. We needed someone who belonged to us. Almost on cue, Randy Savage arrived in the summer of 1985. Wrestlers usually showed up in the WWF as unfinished products: They would make their mistakes, screw up a gimmick or three, find what worked, and stick with it. Not Savage. From day one, he carried himself like Superstar Graham, worked the crowd like Roddy Piper and used the ring like Ricky Steamboat. He dressed in lavishly ridiculous outfits, custom-made cowboy hats and jackets bathed in pink and lime green. my God. You needed a translator even if he was speaking in English. Those first few weeks, you watched him and said, "Eventually, I'm going to figure this guy out." Nope. Thanks to YouTube, his finest work endures with titles like "Macho Man on coke" (it just seemed like it) and "Macho Man is insane" (possibly true). He made Johnny Rodz seem predictable. maybe we should import a few attractive ladies in here to mix it up"? It's a great question. Better late than never. Their original storyline apparently was written by Ike Turner: Savage played the jealous, abusive boyfriend who blamed the late Elizabeth for everything, a twisted version of a "damsel in distress" plot. More than once, she would screw up a match and Savage would pull her into the ring by her hair, with fans begging him not to hurt her. Every time, and I mean, every time, we were freaked out that Elizabeth -- more beautiful than just about anyone in 1985 with the possible exception of Kelly Preston, by the way -- might get roughed up by her jealous boyfriend even though it never actually happened. I'm not condoning this angle (and it never would fly in 2011, or even post-OJ, obviously), just noting that Savage had so much talent that even the "mean-spirited, potentially abusive boyfriend" gimmick couldn't hold him down. How many wrestlers could have parlayed that into "good guy" status? Those Elizabeth blowups and goofy interviews reinforced Savage's defining trait: his unpredictability, always the best thing about his wrestling. If Jimmy Snuka was the Dr. J of jumping off the top rope, then Savage was MJ. Wrestling moved pretty slowly back then: lots of headlocks and clotheslines, lots of rolling around, lots of killed time, lots of fat rolls and labored breathing. Savage murdered that era almost overnight. He dragged 20-minute matches out of Hogan and took 90 percent of the bumps. He climbed to the top rope and delivered flying assaults to opponents outside the ring, which I can't remember having seen before. His devastating finishing move (a flying elbow off the top rope) was so convincing that you always wondered, "Wait, is he actually hurting people when he does that?" Everything peaked with his Steamboat feud, which started when Savage "crushed" Steamboat's larynx with the timekeeper's bell. (Steamboat "lost" the ability to speak, which led to some of the unintentionally funniest interviews ever done. In general, Ricky Steamboat made Vin Diesel look like Daniel Day-Lewis.) They settled their score in Detroit in front of something like 90,000 people, with their Wrestlemania III battle becoming the first great modern match, the Hagler-Hearns of wrestling moments. In a memorable sports year that included Leonard upsetting Hagler, the Lakers outlasting the Celtics, Indiana shocking Syracuse, Elway unleashing The Drive and Calgary toppling Edmonton, I'd put Steamboat-Savage against any of them. It was that good. The full potential of professional wrestling, realized. For those first few WWF years, Savage simply couldn't miss. He picked the best possible manager and feuded with the best possible people. His nickname doubled as the single best wrestling nickname of that decade unless you want to argue for "The Million Dollar Man." His entrance music ("Pomp and Circumstance") was obviously a better choice than the Village People's "Macho Man," but kudos to him for making the right call. He wasn't opposed to wrestling with his sunglasses on (a lost art, really), and his crazy beard/thinning hair/bandanna/sunglasses look shouldn't have worked but always did. His interviews were phenomenally bizarre and undeniably entertaining, and, by the way, he might have been the first wrestler to refer to himself almost entirely in the third person. 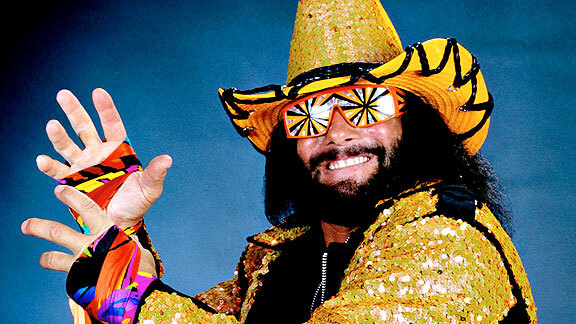 The Macho Man was like the Rickey Henderson of wrestling, right down to the fact that you never knew what the hell he was talking about. Nobody -- repeat, nobody -- was more fun to imitate. Savage said everything in quick bursts, with his voice dropping low, then turning loud, then low, then loud, and any time he couldn't figure out how to end a point, he just screamed, "Ooooohhhhhhhhh yeah!" He used "ooooohhhh yeah!" as a noun, verb and adjective. It never stopped being funny. I could never decide whether the Macho Man was in on the joke. I'm also not sure it mattered. By the time Savage won the WWF title, I was heading to college and starting to grow out of the wrestling thing. It happens. As luck would have it, I landed in a room right next to another freshman wrestling fan. We called him the Birdman, and within three weeks, I was knocking on Bird's door, waiting for him to open it, then whipping baby powder in his face like Mr. Fuji's salt and "attacking" him. There was no wrestling joke we couldn't beat into the ground. The Birdman also did a dead-on Savage impersonation, even better than mine, so we wasted countless hours talking like Savage, doing fake Savage interviews and greeting each other with exaggerated Savage-like handshakes. We made multiple field trips to a local mall that had the WWF's then-superb arcade game, usually arguing over who got to be Savage. Did either of us have a girlfriend? What do you think? only Hogan's budding friendship with Miss Elizabeth was making Savage jealous. Any true wrestling fan knew where this was headed. They were setting us up for a double-cross in that night's tag-team match against Akeem and the Big Bossman. Bird and I kept joking about ditching our dates to catch it, one of those situations in which you're pretending to be kidding but, deep down, you're waiting for the other person to say, "You know what? We SHOULD do that!" Finally, I broke the ice: "Let's go into my room and just check for a second." Bird agreed. We snuck away, went upstairs and turned the television on. Hadn't started yet. We rejoined the party. A few minutes later, we snuck away again in time to see Miss Elizabeth get knocked out cold, with a crying Hogan carrying her backstage for medical attention and Savage eventually ditching the match. After Hogan finished off the Twin Towers by himself, he confronted Savage backstage, with the Macho Man snapping and unleashing his most inspired monologue ever. Lemme tell you why you're out of line, man. You got JEALOUS eyes! at least until my door opened and Bird's date was standing there. Uh-oh. Did either of us get lucky that night? Of course not. Although we did get to re-enact the entire "You got jealous eyes!" scene at 3 a.m. for our floormates, after about 45 beers apiece, with our pal Nick Aieta playing Miss Elizabeth. (Fortunately, no videotape exists. Or maybe unfortunately.) It's one of my favorite dumb memories from college, and, to be honest, it was probably the last night I ever truly loved wrestling. It pulls me back every so often, but not like that. Not even close. Of course, you never stop liking wrestling. When word broke last week that a car accident had claimed Savage, I couldn't believe how many people emailed me about it. He lasted 58 years, forever by wrestling standards, but it still felt too soon. I liked knowing Savage was out there, giving insane interviews and leaving people generally perplexed. The scope of his career can't compare to those of Shawn Michaels or Ric Flair, but you won't find a more meaningful apex: He peaked right as wrestling peaked, ushered in a more athletic era and introduced eye candy (Elizabeth) to a fan base that desperately needed it. We look back at the '80s ironically now -- everything is much funnier now than it was then, whether it's outfits, haircuts, movie plots, political incorrectness or even a sweeping lack of self-awareness. Savage tapped into those faults better than anyone. He was the '80s, for better and worse. And then there's this: I became a wrestling fan thanks to a moment that I never expected, but, gradually, you learn what to expect. You see the angles before they happen, the twists before they twist, the double crosses before they're crossed. Only Savage kept me guessing. The man captured all the reasons I loved wrestling better than anyone, and, for that, Randy Savage will always be my favorite. Oooooohhhhhhh yeah. And then some. Bill Simmons is a columnist for ESPN.com and the author of the recent New York Times No. 1 best-seller "The Book of Basketball," now out in paperback with new material and a revised Hall of Fame Pyramid. For every Simmons column and podcast, check out Sports Guy's World or the BS Report page. Follow him on Twitter at http://twitter.com/sportsguy33.